Regarding my archery gear, I stand firmly on the “Keep It Simple, Stupid” side of the fence. And when it comes to figuring out where to aim on a wild turkey, things can get complicated in a hurry. Trying to decipher the location of the heart/lung area when a tom or jake is in full-strut, three-quarter strut, half strut, no strut, head-on, quartering toward or away, facing straight away, etc. is no easy task. The heart/lung area is approximately the size of your fist, so you don’t have much margin for error. To avoid this brain teaser during crunch time, a head/neck broadhead eliminates all questions. If you can see a turkey’s head or neck, you know EXACTLY where to aim. Period. The author (left) and his hunting buddy with two South Dakota turkeys that lost their minds thanks to Magnus Bullheads. Specifically, I use the 125-grain Magnus Bullhead, which is a fixed-blade design with 3.75-inch cutting diameter. Delivering this fatal package to the bird is a .300-spine, full-length Victory arrow featuring four 4-inch feather fletchings (try saying that five times fast). You can buy these products in a Bullhead Bow Kit 125, which includes two broadheads and two arrows. And get this: The broadheads have a lifetime replacement guarantee. A deadly head/neck system: 125-grain Magnus Bullheads and four-fletched Victory Arrows. I change nothing on my compound bow for turkey season other than switching to this arrow/broadhead system. I limit my shot distance to 10 yards, and to prove that the broadhead/arrow combo flies well, I simply place an inexpensive pillow in a cardboard box and stand up the box at 10 yards. I rip off a 6-inch piece of duct tape and stick it to the center of the pillow. The vertical tape mimics a turkey’s head/neck. During practice sessions, the arrow/broadhead combo crashes into the pillow/box and then falls to the ground — lay a towel or blanket under the fall area if shooting indoors to protect the arrow. Tip: Don’t be surprised if at very close range (think 10-15 feet) that you must use your second sight pin to hit your spot. Test it so you know before aiming at a gobbler. There's a saying among dedicated Bullhead users: "Duck or bleed!" It’s a pain to pick shotgun pellets from the breast of a harvested wild turkey, and the same is true when trying to remove feathers, and possibly blood and guts, from the breast after you’ve killed a bird with a body-shooting broadhead. The amount of cleanup is largely determined by the shot angle to the bird and the type of body broadhead utilized. However, when you kill a tom or jake with a Magnus Bullhead, it’s as if you picked up that bird at the local grocery store. The breast meat is pristine. In fact, I swear that those times when a Bullhead literally takes the head off a wild turkey, that the bird bleeds out and the breast meat is even lighter colored than normal. It’s wonderful. 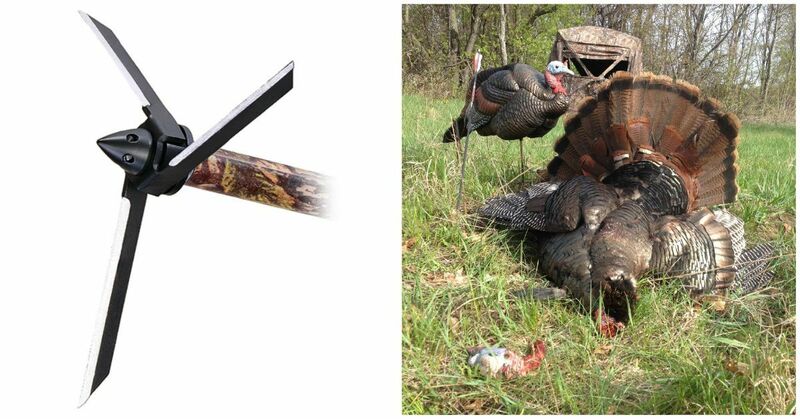 If turkey season is still rolling in your area, then don’t be afraid to give the Magnus Bullhead/Victory Arrow system a shot. And if your season has already ended, think about giving it a go next spring. You won’t be sorry.